303® Mold & Mildew Cleaner + Blocker quickly and safely cleans and removes tough mold and mildew stains from virtually any water-safe surface. Not only does this product CLEAN unsightly mold and mildew stains that have already formed, it will also help PREVENT mold and mildew stains from re-occurring on the treated surface. 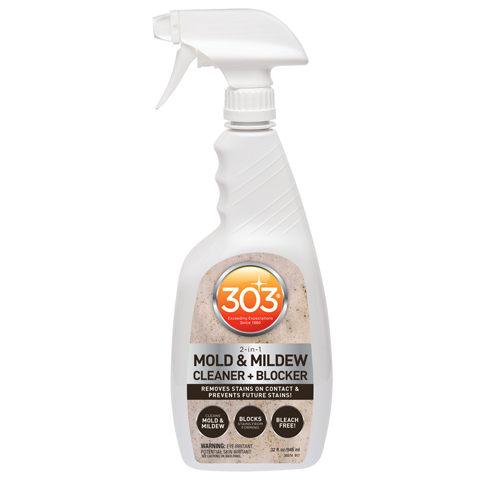 Unlike other mold & mildew cleaner products on the market, this product does NOT contain bleach, and will leave behind a fresh scent, with no strong odors to worry about during or after use. Works safely on vinyl, plastic, painted surfaces and even safe enough for use on fabric! Removes mold & mildew stains on contact. Works on ALL water-safe surfaces, including vinyl & fabrics. Use on vinyl boat seats, vinyl or fabric covers, cushions, upholstery, plastics & more.